When the television is on in our home and the children are watching, there is only one channel that they watch–PBS. When we lived in Wisconsin, that meant that the girls were able to watch thirty minutes of Mr Rogers each morning. Back then, Mr. Rogers was preceded by an episode of Sesame Street which included a short episode of Elmo's World sandwiched in the middle of the program. On the days when my children would catch the last bits of Elmo's World before watching Mr. Rogers, the contrast between the two programs was stark. The busyness of Elmo's World, the chaotic music, the jumping from one snippet to the next, the throwing out of lots of information, delivered quickly and with a snappy, fast-paced approach. Some days I could barely stand to be in the same room while the show was on. It was too much to process. Sensory overload. 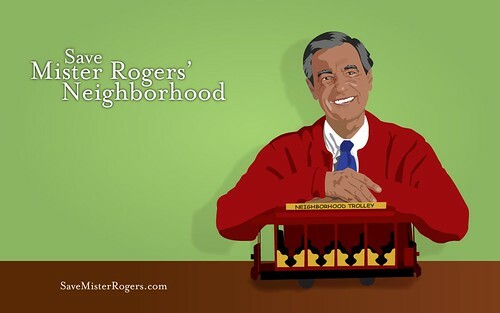 The show stood in strong contrast to Mr. Rogers Neighborhood. From the beginning, the show was like watching a work of art slowly unfolding. There was routine, a slower pace, peaceful music, a kind voice, a gentle curiosity and encouragement. I felt my mood soften and relax. Recently, I became aware that Public Television is making plans (already implemented in some states) to remove Mr. Rogers Neighborhood from its weekly lineup for children. In some places, it will get shoved to a weekend time slot, for other stations it will be gone all together. Mr. Rogers is timeless. It's not only about nostalgia– watching a show with my children that I watched as a child. Fred Roger's carefully crafted program has a message that is just as important to today's children, if not more, as it was to children of my generation. In an era where more and more children are parented by their televisions, the need for a program like Mr. Rogers to be on the air holds even more weight and importance. In my opinion, PBS is doing a disservice to children today by removing this show from their schedule. For me, saving Mr. Roger's Neighborhood really isn't about keeping a show on the air that I want my children to watch. Because chances are, my children won't be watching television very often. My strong feelings about this are stirred up by a concern and care for children today–for the children I don't know and will probably never meet–but children who need the reassuring, encouraging presence of Fred Rogers in their life. 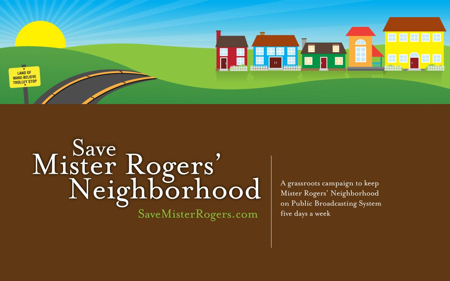 grassroots campaign to save Mr. Roger's Neighborhood. Has two quotes on his site that really captured some of what I believe about this program. fragile, budding sensitivity and ethical consciousness. last place on television where real life may actually still be found. I hope you'll take a few moments to explore his site and find out exactly what you can do to make your voice heard on this important issue. I received an email last week from Brian about creating a blog button for his campaign. Understandably, he has a full-plate right now, not to mention twin toddlers. I've taken the liberty of creating a blog button by resizing one of the downloadable desktop images on his site. Once I receive the okay from him, I'll be happy to email the code to anyone who is interested in placing a button on their blog as well. Just let me know. What an important thing to be concerned about. I love Mister Rogers and wish my boys were more interested in him. As you said, we don’t watch much t.v. either, but there are loads of kids who need his quiet reassuring manner and the message that “it’s you I like, not the clothes you wear or the way you wear your hair, it’s YOU I like.” That’s what we try to teach our kids every day, isn’t it? Thanks for the info. I signed an online petition to keep this show on the air a few years ago. I feel even more strongly about this now than I did then. I’d like the button too. I would love the button. thanks for passing this on, molly. I’m always amazed how so many people thinks bigger/stronger/faster/louder is better. Mister Rogers’ Neighborhood is like a calm in the middle of the flashing lights of children’s programming. I certainly hope it remains on the air. Thanks for the info…I had no idea this was happening. Mr. Roger’s Neighborhood is possibly the only good television show on TV- I’m visiting those sites right now! Mr. Roger’s used to be on PBS 2x’s a day when my older ones were little. I grew up with it too. I am so upset they would take that off the air . But kids today are so used to the fast images of Elmo, Zula Patrol, Super Y and all that other stuff, maybe he just can’t compete, how terrible:-(We have no cable either so I have resorted to getting his shows from Netflix.I will gladly post the button and write something up on my blog, thanks for sharing this. Amen to all you have said. I don’t even think my children have ever seen Mr. Rogers. But that is not the point. Things like Elmo ARE sensory overload. There should always be a place for a beautiful, quiet alternative to all the “edutainment” out there. I once lost a job because I adamently refused to behave like a clown for 3-5 year old children. You have me all fired up. I’m going to do a post about this, too. thanks for the button, Molly! Wow. I do not have children yet, but I work with plenty of small children and let me tell you that the quality of programming for children these days freaks me out. I watched Hannah Montana at a friends house the other day for the first time, to see what all of the fuss was about, only to see that it was about nothing. Fluff. My husband and I have already discussed the TV situation, for when we decide to have children. Most of our favorite programs from when we were small are on DVD, and that is what our children will watch, for the most part. Okay, I’m ranting here – but I will definitely check out the campaign to save Mr. Rogers! We watched Mister Rogers growing up. I remember my mother saying that he was especially good for my overly energetic brother – it calmed him down and he loved Mr. Rogers. I think in this frenetically paced society we live in, there is great need for calm and order and quiet. Although I don’t encourage a lot of tv watching, it would be a shame to let Mr. Rogers’ program stop. What would take its place? Another loud, fast, energy-jolt show? I hope not. Oh my goodness, this post brought tears to my eyes. Okay, almost every single time we watch him I get tears in my eyes. I’m on board with saving him! I completely appreciate the calmness of his show after Elmo’s crazy World. And the simpleness of the toys he shows and creates. That’s imagination. I love being able to count on young people to keep me current. My husband worked on the SETS! of Mr. Rogers in Pittsburgh a million years ago, and while on Nantucket we always took our children to see his “other” neighborhood. Saving Mr. Rogers is about saving A LOT more than Mr. Rogers. I was just reading an article today about how Mr. Rogers conducted his show to truly “speak” to children. Amen to this! Done and done. I have enjoyed watching Mr. Rogers ever since I was little. After I married my wife from India, I watched for over a year with my children. It was my family’s favorite show. Their television viewing is limited to mostly Mr. Rogers. I e-mailed a note to PBS stating that I could not find Mr. Rogers on the TV. They stated that it was on cable TV. The original announcement stated that it would be aired once a week. That is fine with me. However, they did not state that it would be moved to cable TV. If they did, then I would not have deleted the old episodes of the show from my DVD-RW. If a viewer is required to pay for cable to see it, then should the non-cable PBS expect donations? There is no childrens show today like this. Its wholesome message has a message for children and adults. Sesame Street was kept on the air because it kept up with times by imitating modern times. Mr. Rogers stayed simple. I have worked as a teacher in middle school and high school. Currently, I work at Lehman Colllege. Unfortunately for me, Oregon has already gotten rid of Mr. Rogers, for the most part. I emailed OPB to ask why and they pretty much told me his show was irrelevant to today’s kids. Wow. Amazing what some people find irrelevant. But I still sent an email to PBS and have included the button on my blog. Thank you!